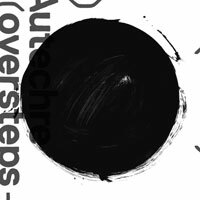 Both Autechre and Warp Records are to be commended for offering an absurd variety of ways to listen to Oversteps. Vinyl, .mp3, 16-bit .wav, 24-bit .wav and CD. Since 320kbs is how most of my music ends up, I only spent ten dollars. I still feel a bit weird about that, since I have every other available CD release sitting on the shelf behind me. I know it’s the future and all, but I still feel a pang of regret, like something has been lost. There are few regrets on Oversteps – it’s a little bit old, a little bit new. As I’ve mentioned before, the key to each Autechre release are their cover art. A black circle, clean upon first glance but on closer examination appears to be a bit smeared. A mighty grey san serif runs in the left-hand corner, top to bottom, with their name half-eaten by the black stamp. Ok, first off everyone is going to be all like “WHOAAAAAH melodies and stuff WHOAAAAH!” Well, yeah, mostly. But up close, smeary and drifting, their most “ambient” release since Amber, at least in the sense that’s there’s not nearly as heavy a reliance on beats to convey mood. And convey this album does – the above track is both cheery and a bit mopey, in that the harpsichord lead reminds me most of a Coil song or four from their early days. While Oversteps isn’t going to win over anyone who stopped listening back in the mid-90s, it stands a better chance of doing so than anything else, outside of Quaristice. I think it’s a remarkably enjoyable and catchy experience, a synthesis of all the elements produced in a career that has spanned almost two decades. For synth nerds, expect to hear quite a bit of the more stereotypical FM sound (broken pianos, chimes and bells); can a DX re-re-revival be far behind? It’s straightforward without being dull, and weird without being weird for weirdness’ sake. Not quite funky*, no, but there are moments – notably “Treale” and “d-sho qub” – where the really old style shows through, though the latter track eventually melts in the style of their more recent releases. Quite a few songs that nod towards their early days in tone and, to a far lesser degree, structure. A fantastic way to close this, their most “difficult” decade. Most remarkable of all is the final track. “Yuop” touches on nearly every single element of the Autechre sound in chronological order. It starts with a low hum and a rhythmic series of acidic stabs, followed by those once-ubiquitous synth horns. A huge reverberating bell strikes in the background as the picture becomes more dense and begins to smear, running out of space as each element distorts and breaks down. This messy stew slowly fades out, eventually falling into a low throb that mirrors the long fade in that started Oversteps. * By funky, I mean “machine funk” or the same kind of funk one could reasonably accuse Kraftwerk of inventing.